← Brooksville, Florida. 17th August, 2012. A stretch of the northbound lanes of Orange Avenue in Coronado are back open after Caltrans crews worked to repair a sinkhole. The sinkhole was reported at about 3:20 p.m. Saturday on Orange Avenue near 10th Street, prompting a SigAlert to be issued for the area. Crews estimate the sinkhole to be 3 feet by 3 feet. 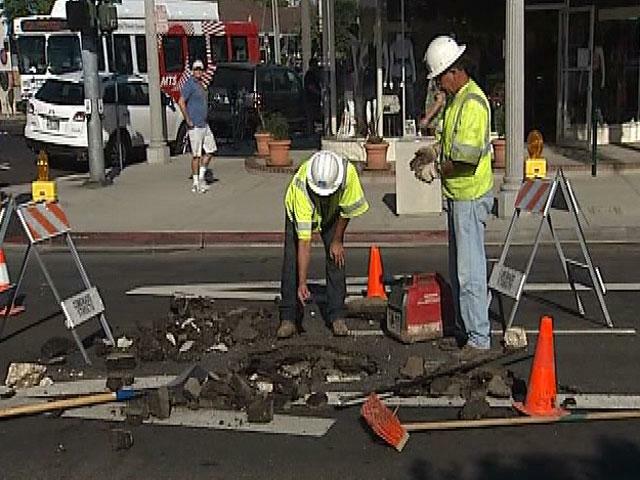 The northbound lanes of Orange Avenue near 10th Street were closed as Caltrans crews worked to repair the sinkhole. Traffic was diverted from Orange Avenue to C Avenue. All lanes were reopened at around 7:30 p.m. This entry was posted in Pictures and tagged Coronado, sinkhole. Bookmark the permalink.